An international team led by researchers from Monash University (Melbourne, Australia), University of Oviedo (Asturias, Spain), CIC nanoGUNE (San Sebastián, Spain), and Soochow University (Suzhou, China) discover squeezed light ('nanolight') in the nanoscale that propagates only in specific directions along thin slabs of molybdenum trioxide – a natural anisotropic 2D material -. Besides its unique directional character, this nanolight lives for an exceptionally long time, and thus could find applications in signal processing, sensing or heat management at the nanoscale. Future information and communication technologies will rely on the manipulation of not only electrons but also of light at the nanometer-scale. Squeezing (confining) light to such a small size has been a major goal in nanophotonics for many years. A successful strategy is the use of polaritons, which are electromagnetic waves resulting from the coupling of light and matter. Particularly strong light squeezing can be achieved with polaritons at infrared frequencies in 2D materials, such as graphene and hexagonal boron nitride. However, although extraordinary polaritonic properties – such as electrical tuning of graphene polaritons – have been recently achieved with these materials, the polaritons have always been found to propagate along all directions of the material surface, thereby losing energy quite fast, which limits their application potential. Recently, it was predicted that polaritons can propagate "anisotropically" along the surface of 2D materials, in which the electronic or structural properties are different along different directions. In this case, the velocity and wavelength of the polaritons strongly depend on the direction in which they propagate. This property can lead to highly directional polariton propagation in the form of nanoscale confined rays, which could find future applications in the fields of sensing, heat management or maybe even quantum computing. Now, an international team led by Qiaoliang Bao (Monash Engineering's Associate Professor, Melbourne, Australia), Pablo Alonso-González (Distinguished researcher at University of Oviedo, Spain) and Rainer Hillenbrand (Ikerbasque Research Professor at CIC nanoGUNE, San Sebastián, Spain) have discovered ultra-confined infrared polaritons that propagate only in specific directions along thin slabs of the natural 2D material molybdenum trioxide (α-MoO3). "Our findings promise α-MoO3 to become a unique platform for infrared nanophotonics", says Qiaoliang Bao. "It was amazing to discover polaritons on our α-MoO3 thin flakes travelling only along certain directions", says Weiliang Ma, postgraduate-student and co-first-author. "Until now, the directional propagation of polaritons has been observed experimentally only in artificially structured materials, where the ultimate polariton confinement is much more difficult to achieve than in natural materials", adds co-first author Shaojuan Li. Apart of directional propagation, the study also revealed that the polaritons on α-MoO3 can have an extraordinarily long lifetime. "Light seems to take a nanoscale highway on α-MoO3; it travels along certain directions with almost no obstacles", says Pablo Alonso-González, co-first author of the paper. He adds: "Our measurements show that polaritons on α-MoO3 live up to 20 picoseconds, which is 40 times larger than the best-possible polariton lifetime in high-quality graphene at room temperature". 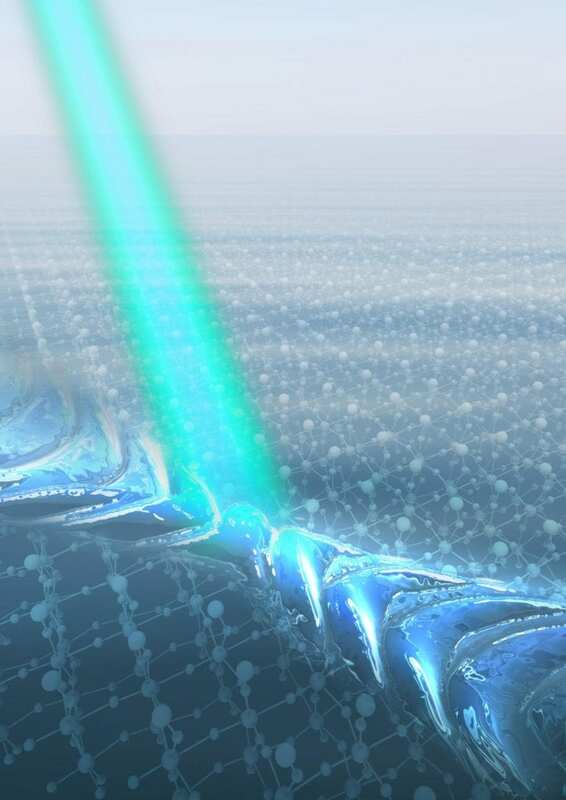 Because the wavelength of the polaritons is much smaller than that of light, the researchers had to use a special microscope, a so-called near-field optical microscope, to image them. "The establishment of this technique coincided perfectly with the emergence of novel van der Waals materials, enabling the imaging of a variety of unique and even unexpected polaritons during the past years", adds Rainer Hillenbrand. For a better understanding of the experimental results, the researchers developed a theory that allowed them to extract the relation between the momentum of polaritons in α-MoO3 with their energy. "We have realized that light squeezed in α-MoO3 can become "hyperbolic" making the energy and wave-fronts to propagate in different directions along the surface, which can lead to interesting exotic effects in optics (such as e.g. negative refraction or "superlensing")", says Alexey Nikitin, Ikerbasque Research Associate at Donostia International Physics Center (DIPC), who developed the theory in collaboration with Javier Taboada-Gutiérrez, and Javier Martín-Sánchez, PhD and postdoctoral researchers, respectively at Alonso-Gonzalez´s group. The current work is just the beginning of a series of studies focused on directional control and manipulation of light with the help of ultra-low-loss polaritons at the nanoscale, which could benefit the development of more efficient nanophotonic devices for optical sensing and signal processing or heat management. Australia: FLEET funding under the Australian Research Council Centres of Excellence program. The research was performed in part at the Melbourne Centre for Nanofabrication (MCN), an Australian National Fabrication Facility (ANFF). Spain: Ministry of Economy, Industry and Competitiveness, Clarín Programme from the Government of the Principality of Asturias, Maria de Maeztu Units of Excellence Programme. Europe: European Research Council under the Starting grant 715496, "2DNANOPTICA".